I've spotted sunshine! Yes it's official this past week or so we have had some lovely days here in the south of England, full of sunshine and summer breezes! So I think it's time to say goodbye to some of those dark sultry lip shades we have been wearing through Winter and say hello to some fun, bright lip colours for Spring! 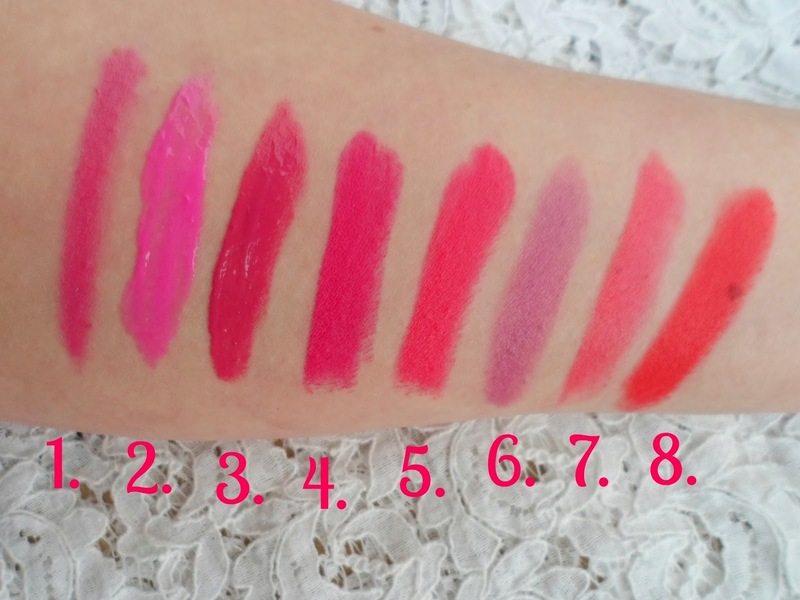 I've narrowed it down (believe me it was hard) to my favourite 8 lip products/colours for Spring for you all! Spring for me is about cute, fun colours, florals & generally pretty girly things. It's the time where fashion starts to change and it isn't such a crime to wear bright and pastels shades daily and I love it! 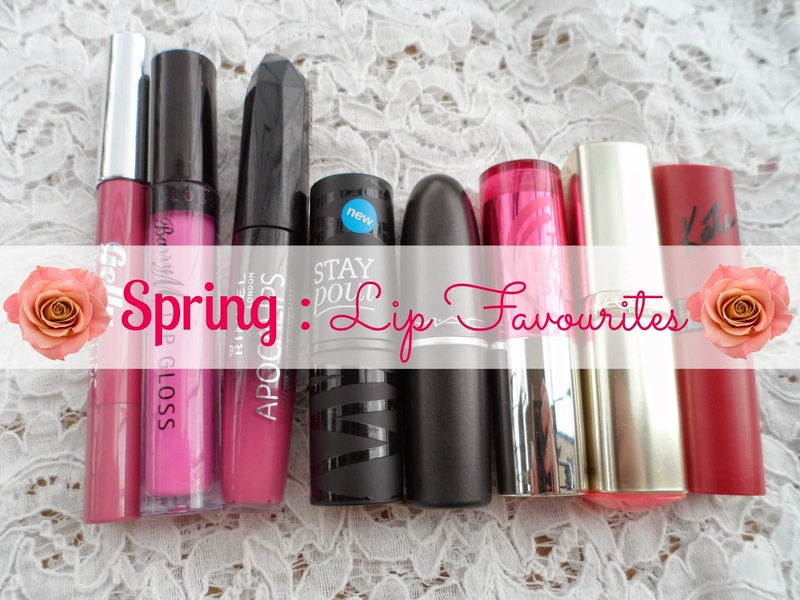 So here are my top picks for Spring lip products! Yes, it's plain to see here that I have a major love for pink lip colours - the amount I own is ridiculous but these are the few I've picked out for a perfect Spring time look! A total newbie in my lip collection - you may have seen my post on this new collection from Barry M last week. This is just such an easy colour to wear, perfect for everyday and the hi shine it gives is gorgeous! 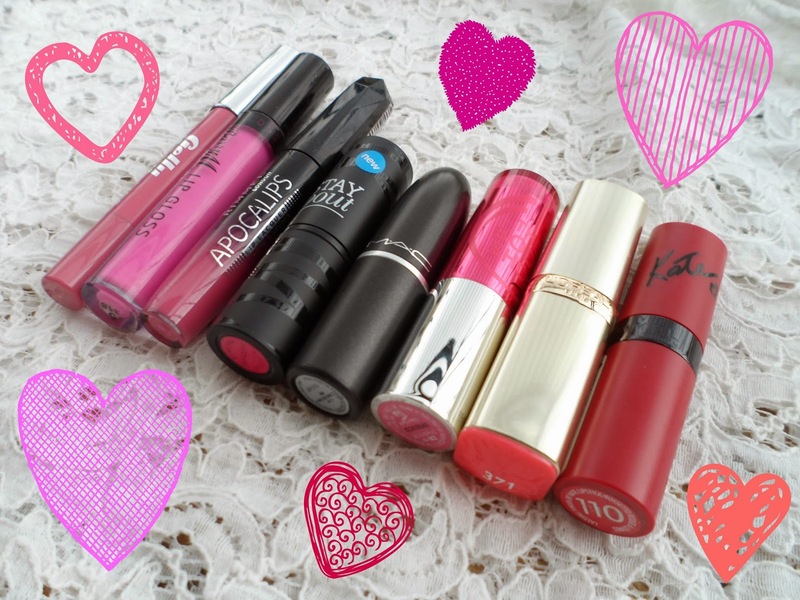 If you've read my blog since it started properly last May you will know how much love I have for these lipglosses! I have worn these constantly for years - not only is this Bubblegum a gorgeous colour (who doesn't love Barbie pink) but it smells like bubblegum too, so yummy! If you are after a new cheap, good quality lip gloss - I highly recommend you try this beauty! Apocalips are a fab collection. Last summer I lived for these. I love this shade, it is my most worn of the collection. Such amazing pigmentation and they stay for ages! Delinquent is a fab fuchsia colour which only needs one swipe to create a flawless look. Perfect to wear both in the day and on a night out, this is a great lipstick and for under £5 I have no complaints. Obviously a mac lipstick had to be in this post. Impassioned is a bright pink, creamy lipstick which is one of my favourites from my mac lipsticks! Here's my post all about it - here. A lovely moisturising lipstick, with a slight purple tint this is gorgeous. Slightly sheerer than the rest but keeps the lips hydrated and smooth. A peachy pink colour for L'oreal I love that this is a slightly different shade than the rest. Ill definitely be wearing this alot this Spring/Summer - I definitely want some clothes to match it too - cute! Kate Moss lipsticks are my favs, for the price they are incredible an have such a good range of shades! This is a super bright orangey colour which really lasts. Can't wait to rock this with a tan! What are the lippies you've been reaching for now the sun has appeared? Girl, RIMMEL Apocalips is my favorite EVER. That color is perfect for spring, too! Great suggestions.. I'm dying to try that MAC Impassioned color! Happy Sunday! IMPASSIONED IS WHERE IT'S AT. I am a pink lips fan too! I have been wanting to try Apocalips for aaaaaaages. You should try the new Bourgeois color boost lipstick, their colours are fantastic, they last really long and it is always a plus, they kind of moisturize your lips. I absolutely love them, I think they became my all time favoruite lipsticks. Such pretty shades! I really like the Seventeen Stay Pout in Delinquent and the Body Shop Colour Crush Lipstick in Rush Of Pink just beautiful!